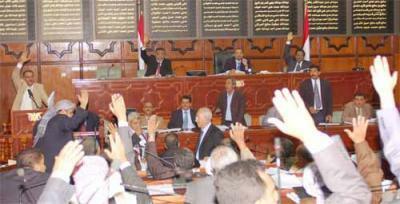 Almotamar.net - Yemen parliament approved Tuesday extending its sessions to the next week to finalize amendments of the general election and referendum law. Assistant Secretary General of the General People's Congress (GPC), the Speaker of the parliament Yahya al-Raei revealed the completion of the political forces of their dialogue on the amendments, expecting approval of the cabinet today to send the draft amendments agreed on by the parties and withdrawal of the previous amendments from the parliament. While the head of the Yemen Socialist Party bloc at the parliament MP Aydarous al-Naqib told almotamar.net that no dialogue or agreement between the opposition and the GPC without the release of whom he called the political prisoners , chairman of the parliamentary constitutional committee Ali Abu Hlaiqa affirmed to the almotamar.net the statement of al-Raei on the parties reaching to an agreement , indicating that his committee was waiting for receiving the amendments draft on Wednesday to study them and called on political parties to focus their attention on interest of the homeland rather than partisan demands.